With winter now in full swing in many parts of the country, it is very easy to fall into the “excuse trap” when it comes to getting to the gym for your workouts: it is too cold, the roads are bad, my car got stuck in the snow, it is too much of a hassle to put on my winter cloths, etc. If you are someone who is always looking for a way out of a workout, I have a solution for you. Some think that the only way you can get in a good workout is by going to the gym. This is not true at all. In fact, some of the best workouts I do are done right in the comfort of my own home with just a few pieces of equipment. Keeping exercise equipment at your home is a great backup plan to have if anything comes up and you cannot make it to the gym. Plus, as you know, you always have your own bodyweight to get in a solid workout with. We have discussed the many benefits of kettlebell training on here before, and we know that this single piece of equipment is one of the best you can purchase! The kettlebell will be the most expensive on the list, but it is worth the investment. In a study done by the American Council of Exercise, kettlebell swings showed to burn up to 20.2 calories per minute. In caparison, a spin class only burns 9.8 calories per minutes so you can see the power of the kettlebell. For spending around $40-80, depending on size, the results you will see from kettlebell training are worth the upfront cost! 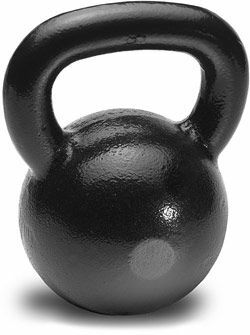 The cheapest place I have seen for purchasing a kettlebell is at Walmart.com. They will ship the kettlebell to a store near you so you don’t have to pay for shipping, unlike other online retailers. Click HERE for heavier kettlebells. If you are unsure of which weight to purchase, head to any sporting goods store or gym and try one out. Another powerful exercise and something that can be done right at home. There are many different kinds of home pull-up bars to choose from, so shop around a bit and see which one looks right for you. I find that the best place to go is Amazon.com as they seem to have the best prices. Or simply head to any sporting goods store and they will have them in stock. Pull-ups are always up there on my top five exercises to do, so having a pull-up bar accessible at all times is great! Jumping rope is something I have been doing since I was 10 years old and I still do it to this day. The reason is simple: it is fun and it brings results. 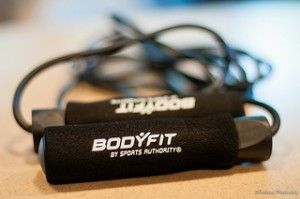 When working from home, a jump rope is really the only thing you need to get in a cardio workout. Plus they are very cheap, don’t take up any room, and can be done just about anywhere! Once again, Amazon is the best place to find a cheap jump rope or at any sporting goods store. You should have no excuses for missing a workout this winter, even with all the crazy weather happening. Head out and invest in the three pieces of equipment above and start going to work! P.S. Like this post? Hit that ‘Like’ and Tweet button for me before you leave! Thanks.